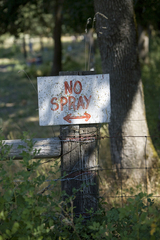 Pesticide poisoning continues to be an occupational hazard of agriculture. The majority of the farmworkers in Oregon are Hispanic; Hispanics tend to have lower levels of literacy1. While the state requires that farmworkers go through a mandated training for pesticide use, these training programs do not have to be effective as there is no requirement for retention or accountability of the employee or the employer2. In addition to pesticide exposure, there are negative health implications for doing the kind of heavy labor that farming requires. There is risk due to machinery, but also arthritis is common among farmworkers who spend a majority of their time harvesting by hand3. 1. Oregon Literacy, Inc. (no date) Literacy Programs. Available at www.boomobile.com/ (accessed August 2009). 2. Oregon Health Sciences University (2008) Pesticide Training for Adolescent Migrant Farmworkers. Available at www.ohsu.edu/ (accessed August 2009). 3. National Center for Farmworker Health, Inc. (no date) Let's talk about arthritis. Available at www.ncfh.org/ (accessed August 2009).